Market leader Broadtrans has built a solid reputation as Perth’s premier civil construction company, partnering with the most well respected builders, engineers And developers on a diverse range of projects since first breaking ground in 2004. 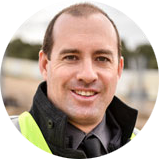 The WA owned and operated company offers expertise in a wide range of capabilities – from civil works, earthmoving, roads and infrastructure, car parks and land development. This has seen the company build and maintain its status as Perth’s one-stop solution for civil construction. Repeat partnerships with the biggest names in civil engineering, commercial and residential construction and land development are down to Broadtrans’ vision of providing better quality, cost and delivery. Its ability to build strong working relationships, contribute positively to work sites and its in-house team’s skill in handling each project from green light to completion make Broadtrans a market leader. Satisfied clients return, thanks to Broadtrans’ ability to deliver a successful outcome on every project, every time. However, the company is constantly expanding and warmly welcomes new partnerships to experience the top end customer service at Broadtrans. Gavan is a second-generation earthmoving expert who started learning the ropes from his father at the tender age of 10. His father’s strong work ethic and dedication to get the job done has shaped Broadtrans as it appears today. Having also worked long term for Seacrest Homes’ Delstrat Earthmoving company, his entrepreneurial passion saw him go it alone in 2004 with the inception of Broadtrans Earthmoving. The company went from strength to strength and expanded into Broadtrans Civil in 2012.